I heard that eating fish on New Year's Eve- Eve brings good luck for the upcoming year. No, not really, I just wanted to make them, and felt the need to justify it. These tasty little bites are incredibly versatile and easy to make. They are shown here on a bed of mixed greens with tomato, carrots, a wedge of lemon, and a drizzle of balsamic and olive oil for a light dressing. 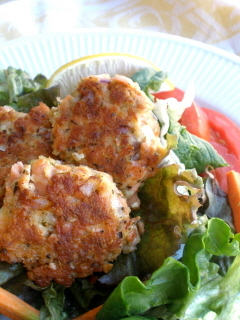 However, the patties would be wonderful with pasta, in a pita, or alone with a side of veggies. Preheat oven to 350°. In a small pie pan place salmon fillets, sprinkle with pepper on both sides. Cook at 350° until salmon flakes with a fork, about 13 minutes. While salmon is cooking prepare bread crumbs and place in a medium mixing bowl with red onion, Italian seasoning, and parmesan cheese. When salmon is cooked through, remove any skin and discard. Place fillets in bowl with crumb mixture. With two forks flake the salmon. Once flaked, add egg and stir to combine. In a medium skillet add EVOO and heat over medium. Once oil is hot form patties into ¼ C. rounded balls and flatten them slightly. Use all the mixture this way and add the medallions to the hot pan. Brown patties on both sides, this will take about 3 minutes on each side. Serve immediately.